The Steinway Society celebrates its fourteenth season. Over the past fourteen years more than 70 talented pianists have performed in over 80 concerts or musicales. Shirley Fan, an accomplished performer and piano teacher is a graduate of the Juilliard School of Music. Having studied with Joseph Raieff and Willaim Masloes, Ms. Fan has won piano competitions in both Taiwan and New York. Her solo and chamber music recitals have been at Lincoln Center, Paul Hall at Juilliard and Rachmaninoff Hall, Moscow. She earned her Master of Music degree in piano performance and pedagogy from Westminster Choir College of Rider University. Her advanced certification with distinction in piano performance came from The Royal School of Music and a chamber music certificate from the Moscow School of Music. After teaching at Westminster for seven years, she now has a private studio in New Jersey. Currently, Ms. Fan is the chairperson of the Piano Festival Program of the NJ Music Teacher Association. Timothy Urban holds graduate degrees in music performance (voice, recorder and early music performance practice), music theory and a Ph.D. in musicology. He also received a Fulbright Scholarship for study at the Kodaly Institute in Hungary. Dr. Urban has presented music recitals in Hong Kong, Taiwan, Hungary, Brazil and various locations within the United States. He is currently on the faculties of The Mason Gross School of the Arts at Rutgers University, Seton Hall University and Westminster Conservatory of Music. He has served as an officer of the New Jersey chapter of the National Association of Teachers of Singing. Dr. Urban presented with Ms. Fan programs of Russian music and vocal chamber music at Westminster Conservatory and St. Paul’s Festival of the Arts in South Nyack, NY. Mr. Falzone has been described as a ‘brilliant and intense’ young pianist (18 years old) who displays the qualities of a great artist. Beginning piano study at age four, composing at age six and playing chamber music at age ten has earned him critical acclaim and numerous national and international awards for his solo/chamber piano performances and compositions. As soloist, chamber player and concerto artist, Mr. Falzone has performed at Carnegie Hall, Lincoln Center, Kennedy Center, Hollywood Bowl and Suntory Hall in Tokyo. Awards received as soloist include second prize in the Young Concert Artists International Auditions, first prize in the National Yamaha/Music Teachers National Association High School Piano Competition, first prize in the International Bartok/Kabalevsky Piano Competition, first prize in the National Baldwin/MTNA Junior High School Piano Competition, a ‘Best in Festival’ in St. Petersburg, Russia, and second prize in the International Stravinsky Piano Competition. The Davidson Institute has named Mr. Falzone a ‘Davidson Fellow’ in recognition of his prodigious achievement, his portfolio, ‘At the Piano – A Celebration of Human Expression and Creativity.’ As a chamber musician, his ensemble, the Orion Trio, received first prize in the Fischoff National Chamber Music Competition. He also plays with The Favrile Quartet, which was selected by Isaac Stern to participate in his three-week workshop concluding with the quartet debuting at Carnegie Hall. Mr. Falzone currently studies with Leon Fleisher and Claude Frank at the Curtis Institute of Music. His program will include works by Frederic Chopin, Claude Debussy and Franz Schubert. The duo pianists have performed regularly throughout the United States since 1984. 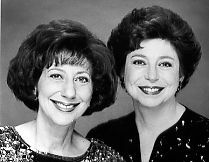 Both solo artists and academic colleagues, Ena Bronstein Barton and Phyllis Alpert Lehrer bring a depth of musical understanding to the repertoire for two pianos. Their widely acclaimed CD features performances of music by Mozart, Rachmaninoff, Altman and Goolkasian-Rahbee.Their performances have been described as ‘evocative, expressive and beautifully integrated’ (Bucks County Courier); ‘Olympian music making’ (Newark Star Leger). Ena Bronstein Barton, born in Santiago, Chile, studied with Claudio Arrau and Rafael de Silva. Since her Town Hall debut, her career has taken her across the United States, back to South America, to Europe, the Near and Far East, Australia and New Zealand. Her extensive tour of Israel and Europe presented her as soloist with orchestras in Jerusalem, Luxembourg and Rome. Her many honors include the 1976 Martha Baird Rockefeller Grant resulting in a solo recital at Lincoln Center’s Alice Tully Hall and the 1996 Distinguished Artists Piano Award by Artists International. Chamber music performances have been with Jamie Laredo and the Guarneri Quartet. Currently, Ms. Barton heads the piano department at Westminster Conservatory of Music, the Choir College’s community school. She is also a member of the piano faculty of Westminster Choir College of Rider University. Phyllis Alpert Lehrer is known internationally as a performer, teacher, clinician, author and adjudicator. Her concert career as soloist and collaborative artist has been in the United States, Canada, United Kingdom, Japan, Sweden, Russia and Taiwan. Currently, Ms. Lehrer is Professor of Piano at Westminster Choir College of Rider University in Princeton, New Jersey. A founding member of the International Society for the Study of Tension in Performance, she has co-authored with Barry Green, the Inner Game of Music Piano Workbook and has edited Chopin: An Album. She is a contributing author to the newly acclaimed text A Symposium for Pianists and Teachers: Strategies to Develop the Mind and Body for Optimal Performance. She has recorded for the Educo and Seda labels. Ms. Lehrer holds a B.A. in music from the University of Rochester and Eastman School of Music and a M.S. in piano from the Juilliard School of Music. ‘NEW AND FORGOTTEN GEMS OF THE DUO PIANO REPERTOIRE’ – The program will include works by Nicolai Medtner, Francis Poulenc and Darius Milhaud. Nancy Wilson has a repertoire ranging from early 17th century violin solos to the string quartets of Beethoven and Schubert. A founding member of many of America’s pioneering period instrument ensembles, including Concert Royal, the Bach Ensemble and the Classical Quartet, she performs regularly with Aston Magna and extensively with the Smithsonian Chamber Players. As concertmaster and soloist, she has performed with leading conductors, Jaap Schroeder, Christopher Hogwood and Nicholas McGegan. Her solo playing has been described as ‘clear and sweet in tone; refined in articulation’ by Gramophone and ‘exceptionally stylish’ by The Edinburgh Scotsman. She has been invited as guest lecturer and clinician at workshops and music schools throughout the U.S. and Europe and currently teaches at the Mannes College of Music in Manhattan and Princeton University. This season Ms.Wilson will be featured in Vivaldi’s The Four Seasons with the Philomel, the Philadelphia-based period instrument ensemble. She can be heard locally as leader of Princeton University’s Richardson Baroque Players and in collaboration with Westminster Choir College’s Fuma Sacra. Her program will include music of J. S. Bach, Beethoven, Mozart and Schubert.